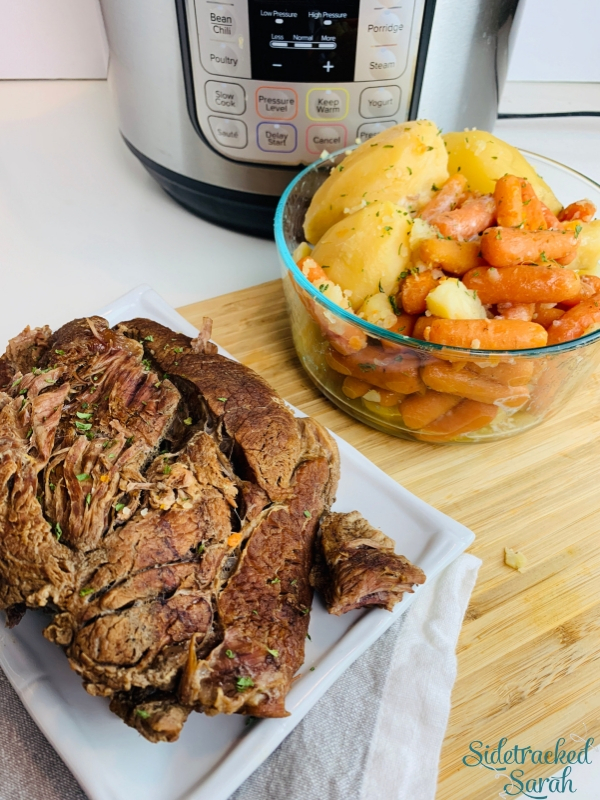 Instant Pot Roast Beef is the perfect family meal. It’s delicious, savory, and comes together quickly! 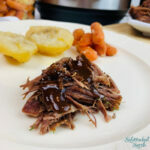 We love Instant Pot Beef recipes! Some of our favorites include Instant Pot Beef Stew and Instant Pot Ground Beef and Rice. Roast beef is one of those family favorites that brings you back to Sunday dinners at Grandma’s or holiday family feasts. It’s so satisfying and delicious! It’s also very versatile. Roast beef makes a wonderful family dinner, but it’s also amazing on sandwiches, in appetizers, and more! However, it usually also takes hours and hours of slow roasting to get that tender, juicy beef and gravy. Who has that kind of time? That’s where the Instant Pot comes in! CAN YOU ACTUALLY MAKE A GREAT ROAST BEEF IN AN INSTANT POT? Since roast beef usually takes the better part of a day to get to the point where it is falling-apart-tender, this is a valid question. The answer is yes! By pressure cooking the roast beef, you can get that “simmered all day” taste and texture in a fraction of the time. No more having to start cooking your dinner at breakfast time! WHAT SHOULD I SERVE WITH INSTANT POT ROAST BEEF? 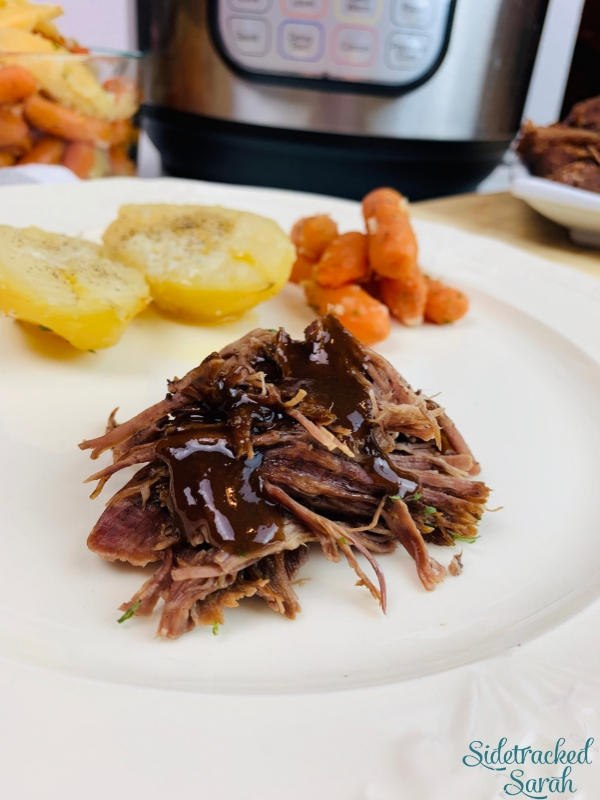 Instant Pot Roast Beef is one of those dishes that really kind of shines on its own. You can cook some root vegetables like carrots, potatoes, and onions along with it, but you can also serve it alongside Cheesy Garlic Instant Pot Mashed Potatoes or Instant Pot Baked Sweet Potatoes. Add in a quick salad and whip up a batch of Southern Cornbread Muffins, and you’re good to go! WILL INSTANT POT ROAST BEEF FREEZE WELL? Oh my goodness, this recipe freezes beautifully. Feel free to portion out the meat and freeze it for future meals! However, you may also wish to keep it in the fridge for delicious lunches throughout the week. 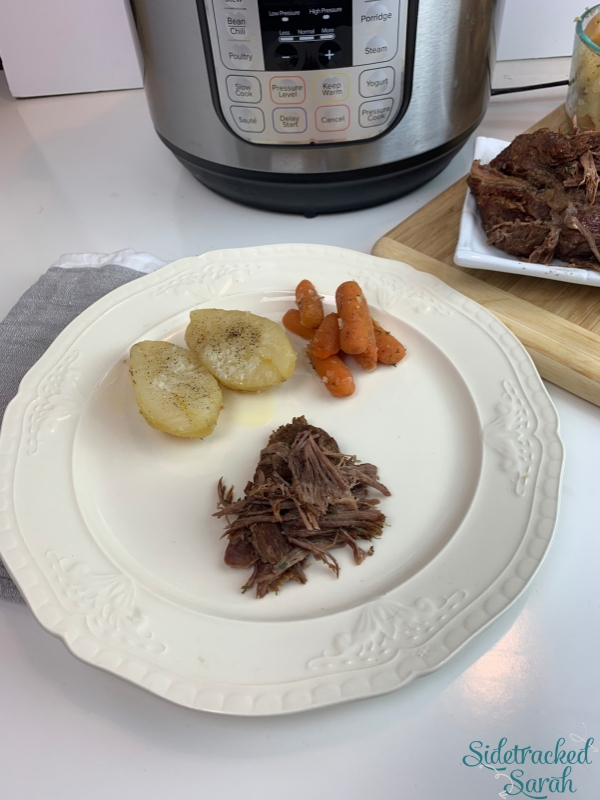 Either way, I hope you enjoy my Instant Pot Roast Beef – it’s a family favorite at our house! WANT MORE EASY INSTANT POT BEEF RECIPES? Mix together salt, pepper, minced garlic and onion powder. Sprinkle over the top of the roast. Place roast in Instant Pot and pour beef broth in around it. Cook on Manual/Pressure Cook, high pressure for 25 minutes. Natural release for 10 minutes, then quick release the pressure. Wash and peel potatoes. Add potatoes & carrots. Naturally release the pressure for 10-20 minutes, then quick release the remaining pressure. Serve the delicious roast beef. 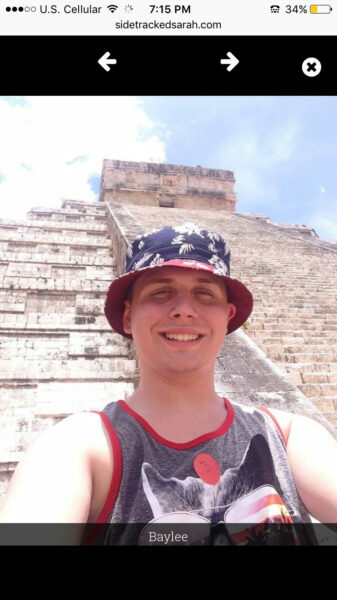 This is a photo that my son sent me when he went on a choir trip to Mexico when he was in junior college. He is now studying social work as a university in Missouri. We are certainly proud of him. He had a great time on his trip!